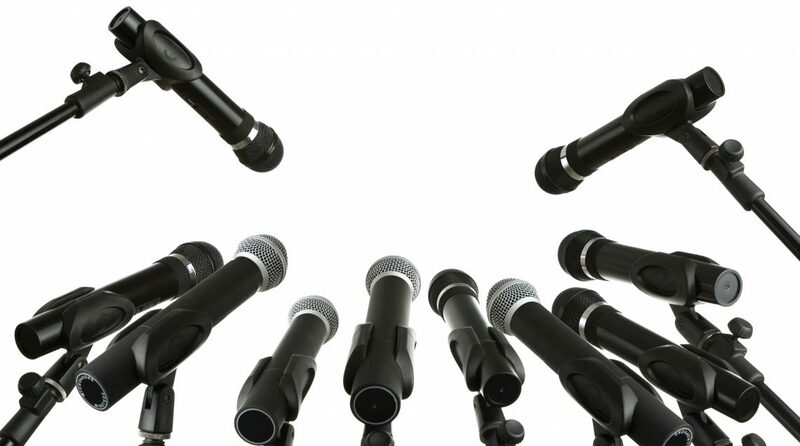 Wireless handheld microphones have been a popular choice for quite a while. Their quality has recently improved so much that you rarely see a wired mic anymore. Wireless handheld microphones are available in a variety of sizes and shapes, and they can be used in a lot of different situations. 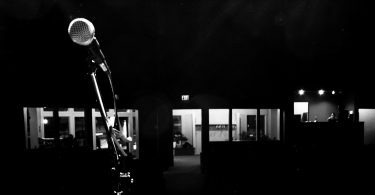 As a musician of over thirty years, I have gigged enough to know that finding the right microphone can make or break a show. 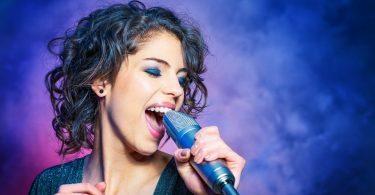 You need a reliable, convenient, and easy to use mic and wireless handheld mics are perfect for live performances, especially with an energetic lead singer. 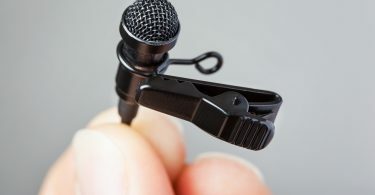 Remember to not only do your research on these microphones, but also go to the store and check them out for yourself, so you can hear exactly what you will be using on stage. When you start shopping, you will find a wide range of wireless handheld microphones to choose from. 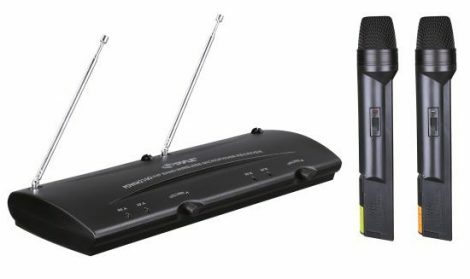 Here are a few tips on what to look for in a good wireless handheld microphone, and a few reviews to help you start your shopping. Easy to use, versatile, and awesome audio experience at a very affordable price. Solid and well-balanced microphone with an external power supply and a set of articulating antennas. A wireless microphone allows you to cut out cables making microphones a lot more convenient for their users. When you connect the microphone to a wireless receiver, it works through a radio frequency or digital signal. Some wireless microphones work with a 3.5 mm jack and will send out the sound through speakers, and other microphones can sit on a flat surface connect to a speaker system through a wire itself. There are several different types of wireless microphones, and the type you use really will depend on your needs. The same goes for the type of receiver or transmitter you will need. Wireless handheld microphones run from very inexpensive at around $20 – $30 to the very expensive, professional microphones that will run several hundred dollars. As always, the more you are willing to spend, the better quality microphone you will get. Many wireless mics come in multiple packs, so it is not uncommon to find two or four mics coming with a wireless system. Whether or not you need more than one mic is completely up to your preferences and needs. 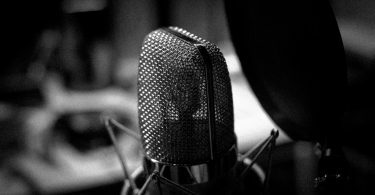 Otherwise, save your money and stick with the single microphone with a transmitter model option. How you will use the mic is an important consideration when choosing a wireless handheld microphone. This will tell you how many microphones you will need, what type of sound you will be transmitting, and how big of a venue you will be working in. Answering these questions will tell you how much range and power you will need. Wireless mics may seem a little more difficult to setup than a wired microphone that just plugs in. To get a basic idea of how to setup a wireless microphone setup, here is a rudimentary startup guide that can be used with most of the available wireless microphone systems. – Make sure your receiver is turned on and the transmitter is turned off. Press the “Automatic Frequency Selection” button that most receivers have and a frequency will be assigned. – Press the button that will have the transmitter sync up with the receiver and the transmitter will connect and be ready for wireless audio. – Make sure you aren’t getting any distortion by checking the signal levels of the receiver and transmitter. If you get either a really quiet or really loud signal, that means you need to adjust your volume level. – The distance between your transmitter and the receiver will have a large effect on the wireless system’s signal-to-noise ratio. When you move the transmitters away from the receiver, your signal will get weaker and the overall signal-to-noise ratio grows. The closer it is, your dropouts will be more frequent and there may be audible background noise. For a lead vocalist, this is the perfect mic. It is also great to use on stage when you need to pass a mic from person to person. The handheld microphone has the wireless transmitter built into the body of the microphone, so you will only have two parts to this type of system the handheld mic with transmitter and the wireless receiver. 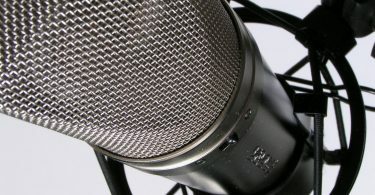 It is common for a manufacturer to have a wireless version of popular wired mic so that singers won’t have to change their sound if they switch to the wireless system. This type of mic is perfect for dance and fitness instructors, singing dancers or drummers, or anyone that is actively moving onstage. This is a system that is worn on your head that is then connected to a bodypack transmitter that you are wearing and a wireless receiver. This is a mic typically used by presenters and public speakers, actors, and worship leaders. The mic just clips to your clothing and is connected to a bodypack transmitter that transmits to a wireless receiver. Omnidirectional mics work well for quieter places like lecture halls while directional lavalier mics are better in noisier environments like a school gym. When you need to mic woodwind, brass and percussion instruments, an instrument mic works well. This system uses a mic that is best suited for an instrument’s sound instead of a voice. These systems have two components, a wireless receiver and a belt pack transmitter that the instrument is plugged into directly. Without worrying too much about the technical parts, there is a basic difference between an analog and digital wireless system. Analog sends your audio sound through the airwaves while digital changes your audio to a digital signal at the transmitter and then send digital signals to your receiver in ones and zeros that are decoded into an analog audio signal. The digital data only concentrates on the ones and zeroes it is receiving and ignores any interference or analog noise. Analog signals try to remove any excess noise from the original signal but it might cause some signal quality loss in the process. There are several things to consider when choosing a wireless handheld mic for live performances. – You need a durable and reliable mic that can withstand travel and live performances. – It should be easy to hold while you are performing as well as comfortable. – It should have no problem with high SPL and have good resistance to feedback. 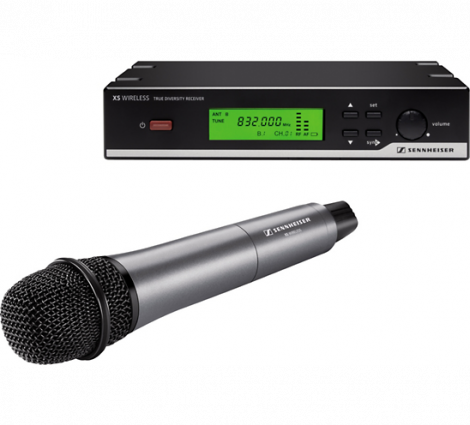 If you are familiar with high-quality microphone wireless systems, you have heard the name Sennheiser. They have a strong reputation in the industry and were one of the frequency synthesis pioneers in wireless. Their XS Wireless XSW 35 wireless handheld mic system has the versatility, ease of use, and great audio that you want at a price you can afford. The XSW 35 handheld system contains an EM 10 half-rack receiver that has an LCD display with detachable antennas, plus the SKM 35 handheld transmitter that features an e835 dynamic cardioid microphone. Spanning a 24 MHz bandwidth, this frequency-agile system also comes with a set of articulating antennas, transmitter with a mic clip, and the receiver comes with an external power supply. The diversity receiver is constructed with a metal chassis and high-impact molded plastic front and rear panels. It has clearly labeled connectors and controls, plus the recessed rear panel keeps the connectors from being damaged in the event it is dropped or bumped. The included articulating antennas have BNC connectors that are provided for Antenna A and B, so either the articulating antennas or the remote antennas can be used. A mic/line switch for various input devices and both balanced XLR audio outputs and unbalanced quarter-inch are included. A squelch control features on the rear panel that can adjust the receiver’s sensitivity and gets rid of interfering signals that create noise, specifically when the transmitter is turned off. The external power supply is usually a standard compromise when you are looking at a modestly priced wireless system. The XSW 35 includes a 12V-DC power supply with both a U.S.-style, two-prong blade and a Euro-style, two-pin connector. Well-balanced and solid, the handheld transmitter is well-matched and includes a permanently attached microphone element that can be cleaned by unscrewing the handle. A LED indicator is included with the recessed power switch which will also tell you the battery level and current frequency. Under the LED indicator is a mute button that can be accidentally triggered if you are not careful. There are three basic menu functions on the receiver with eight preset groups of pre-coordinated frequencies that have 12 frequencies in each group. When running a scan, it checks out every frequency in that group and finds the first available clean frequency to use. The tune function lets you run through all 960 of the available frequencies, and the main screen shows you which antenna is getting the strongest signal through the diversity system. The XSW 35 used a standard wideband FM modulation in the UHF band, and it has five frequency ranges available that span 24 MHz each. The transmitter also gives you 10 mW RF output of power that allows a range of around 200 feet in line-of-sight conditions. The overall audio quality, based on vocal and instruments has been reviewed very positively by users. It has just the right amount of sibilance and has good control of “pop” noises. It is also very quiet while it is held, even if you shake it vigorously. The Sennheiser XSW 35 is available for around $400. 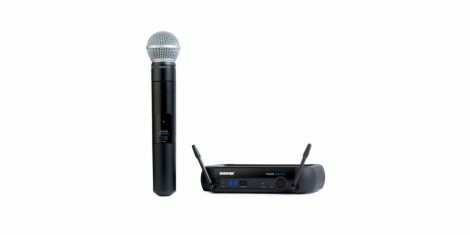 If you are looking for a painless decision when it comes to finding the right handheld wireless microphone, Shure offers a budget-friendly and professional level microphone that is versatile and can be run with other wireless systems. Shure is one of the first names you think when considering a new microphone. The Shure SLX2/SM58 has great flexibility, range, and simultaneous channel count at an affordable price range. The SM58 is known as one of the best microphones on the market and the SLX wireless system utilizes their patented ‘Audio Reference compounding technology’ that includes a setup that will automatically synchronize. 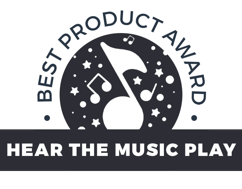 This is a versatile system that works well in a lot of situations including church, boardrooms, lecture halls, and live music. The wireless system has technology with a clear transmission that offers a dynamic range. Instead of other systems that are restricted with a fixed compression ratio, it has a variable compression ratio. are rid of wireless artifacts in a superior dynamic range in the quiet passage making is one of the most solid microphones in the market. If you only need one microphone, the Shure SM58 system is definitely worth a look, especially with all its great reviews. The Shure SM58 is available in the very affordable $220 range. A part of the Pro Series 5 wireless line, Audio-Technica’s PRO-502 wireless system offers professional sound quality and features at a great price. 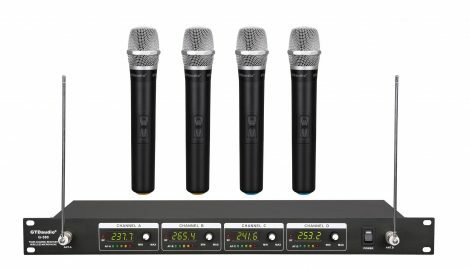 It includes the PRO-R500 receiver and the PRO-T502 handheld microphone/transmitter that can be used with up to seven other Pro Series 5 systems to create eight simultaneous systems. Along with the receiver and transmitter, the PRO-502 wireless system includes the Quiet-Flex microphone stand clamp making it ideal for schools, churches, bands, and business. It is a high-quality system that is easy to use for a variety of speech and vocal applications. It has over 8 frequencies that you can choose from and includes automatic frequency scanning, plus diverse operations that you can use to make it even more reliable and increase the sound range. This system uses a LED channel display along with an antenna together and AF Peak Indicators. The Audio-Technica PRO-502 gives you quality construction with great sound from a brand name that you can trust. It is available for around $400. As always, the Shure BLX Wireless Systems give you a simple setup and intuitive interface with high-quality and legendary performance. This is a precision-built product that can be used in a variety of situations and is one of the best products you can use on stage. 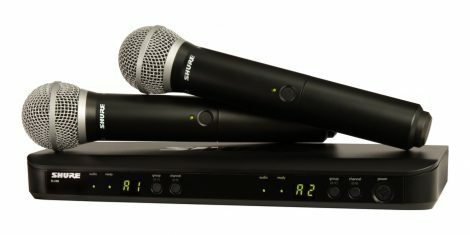 The sturdy Shure BLX88 gives you easy setup, controls that are intuitive controls, and the diversity of a microprocessor-controlled internal antenna. With one-touch QuickScan frequency selection, you can quickly and easily find the best open frequency if you encounter interference. 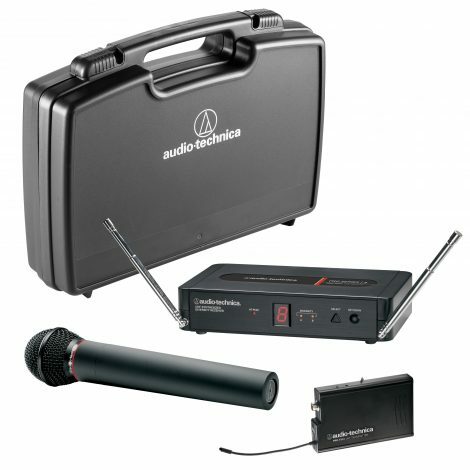 This wireless microphone system has a dual channel receiver plus a transmitter set that each have a mic capsule. The transmitter also has a durable and reliable ABS polymer chassis with its frame. Also included are other features like and ergonomic on and off push button switch, a 10dB pad, and single bi-color. There is a decent windscreen that has a comfortable size and shape. The tabletop receiver comes with QuickScan technology that locates different frequencies finds the best option. If you are interested in more than one microphone, this is a good option to consider. It is available in the $550 range. If you are looking for a microphone on the other end of the price range, Pyle-Pro has used manufacturing breakthroughs to deliver the PDWM2100 system at a very affordable price point for a high-quality microphone. This system is created to produce low distortion, noise, and coloration. This is a lot of microphone for not a lot of money. For over 35 years, Pyle has used their manufacturing expertise and experience to create incredible products that won’t hurt your wallet. This is known as one of the best microphones at this price point and features a VHF base unit that is rack mountable and two mic units. Ideal for small live performances at weddings, religious events, small live performances, and professional engagements, the PDWM2100 is also perfect for small house parties and karaoke night. Providing tons of mobility and freedom, this is an awesome microphone for active and energetic performances as well as events with multiples speakers. It is good for the events where multiple speakers are needed. Remember, you are trading in durability and digital transmission, but are paying a tenth of the price of other mics on this list. This budget-friendly wireless microphone can be found for only $40. One microphone that ranks high in user ratings is the Sony ECM-AW4. It includes a mic system that gets rid of the need for another intercom system. It is a great mic for filming, especially with a video camera. It comes with a 3.5 mm headphone jack in the receiver and transmitter, plus a belt clip with an armband to make wearing it and mounting the microphone and receiver easy. With one-way communication, you can pick up the sound of one the person you are interested in interviewing, record just one person in action, or isolate sound which is a great feature when working with a video camera. The Sony ECM-AW4 also comes with a carrying pouch that protects the transmitter and makes it very portable. It is available for around $170. If you are looking for four mics and you are also on a budget, the GTD Audio G-380H is a great value. It comes with 4 microphones and 4 channel receivers with individual volume controls on every receiver. It has a decent range of 230 feet or 65 meters, and it has a 1/4 inch mixed output with the four XLR individual outputs, plus different frequency options. The 4 microphone units have a high-quality build for the price, and the 4 Channel VHF is very reliable. It includes the ‘surface mounted technology’, and it gives a quality surface with mounted components for guaranteed quality and reliability. 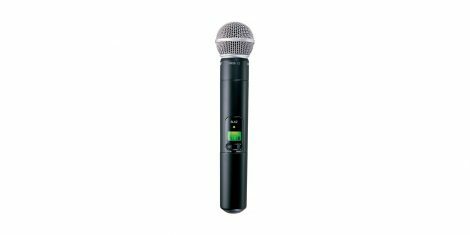 If you are looking for mics for karaoke, church, or professional performances, the GTD Audio G-380 H is definitely worth a look. This 4 mic set is available for only $130. 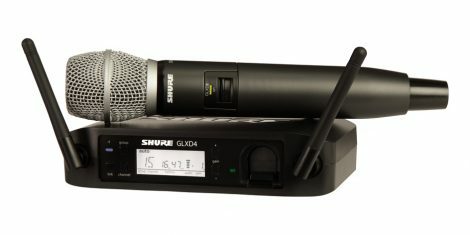 Shure continues its tailored wireless solutions for presenters, vocalists, and guitarists, with the PGXD24 that mixes the well-known name of Shure with 24-bit, state-of-the-art digital wireless technology. The PGXD24 gives you clean and strong RF performance that sounds like you are using a wired, rock-solid RF signal. It has a quick and easy setup, and it is simple to operate. This system includes a wireless receiver and a handheld transmitter, plus a mic that is cardioid dynamic. With ultra-clean performances, the system will scan and sync, so that it is ready to use immediately. It has a range of over 200 feet, and it gives you a huge amount of freedom with its wireless usage. If you want a high-quality, top of the line microphone, the Shure PGXD24 is your answer. It is available for just under $400. For something a little different, check out the Behringer Ultralink that is a budget-friendly option as a little higher tech. It offers some USB connectivity for a little different spin on a wireless handheld microphone. The receivers and transmitters use state of the art technology that can work with a 2.4 GHz frequency band that is better than what some cell phone tower or TV stations use. Replacing batteries is a breeze in the Ultralink, and these mics guarantee that their batteries have long lives. This is a solid wireless mic option with a lot of technology for around $150. If you are interested in operating up to 4 compatible systems under normal conditions and up to 8 under perfect conditions, the Shure GLXD24 is worth checking out. It comes with a best-in-class intelligent lithium-ion battery that is also rechargeable and has up to 16 hours of continuous use that also helps make the mic a more affordable option. Included with the GLXD24 are LINKFREQ Automatic Frequency Management that helps to quickly find the best open frequency for seamless operation and clear digital audio. The incredibly clear digital sound is available in the mid $500’s.